In Drupal terminology the word "fields" is used a lot to mean slightly different things, all related. 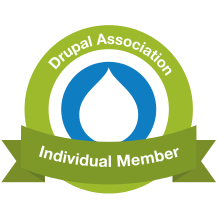 This is partly a consequence of the way the concept has grown organically, through Content Construction Kit in Drupals 4-6 and fields in Drupal 7 core. Let's clarify one or two ideas, through a real-world example. Let's say we've created an event content type (we might also call "event" a bundle for node content entities). We want to model this simple real-world situation. An event has a start date and a location. Let's try to continue using this "domain-specific" terminology below, while we talk about what Drupal needs to do in order to flexibly model the domain. A start date field configuration, containing information about the label and granularity for all event start dates (field.field.node.event.field_start_date). A location field configuration, containing similar information, but also details of how e.g. the longitude and latitude might be represented (field.field.node.event.field_location). These configurations provide semantic meaning for the underlying start date and location: the start date is a point in time; the location is a point in space. In brackets at the end are the names of each configuration entity, as it would be stored in the config table. This dot-separated name comes from the fact that the configuration is, respectively: managed by the field module; pertains to a field configuration; restricted to node entities; associated with an event node; and has a name "field_start_date" or "field_location." When a field has been added to one bundle (for a given entity type), it could be added in future to a different bundle. So events might have a start date; and a notice for some kind of special offer might also have a start date: in a sense, these are the same "date-ish" concepts, such that you could envisage (for example) all active content on the site being sorted by start date, or compared by location. A start date field storage configuration, containing information about the storage type (which in turn determines the SQL columns used) and the cardinality (field.storage.node.field_start_date). A location field storage configuration, containing similar information (field.storage.node.field_location). The dot-separated notation of the config names at the end of each line above imply that the field storage configuration no longer depends on event, and thus could be shared across bundles; but it does depend on the entity type, and so could not be associated with a user, or a taxonomy term. A view display mode, of type default, containing information about how both start date and location might appear to the site visitor (core.entity_view_display.node.event.default). A form display mode, of type default, containing information about how both start date and location might appear to the content editor (core.entity_form_display.node.event.default). Again we look at the dotted names, and it's clear that: there's no longer any field-dependent element to these configuration entities; and entity display modes, and types, are provided by core. A start date field value. Data stored in these field values can be accessed using both a longhand syntax and a shortcut notation, by means of the typed data API which will be discussed later. In summary, then: any one event node has a unique start date (location) field value; all event nodes share (start date/location) field configuration and display modes; and all nodes, of all types, have the potential to access shared (start date/location) field storage. An entity class, which we call ContactType, with annotations and any other methods as discussed earlier; modifications to Contact to reference this. Any custom controllers required for creating new config entities e.g. ContactTypeForm. New routes for the new config entity type; modifications to existing routes for Contact content entity type to support choosing a contact type first. We need to modify our existing routes, to introduce an intermediate step for creating a new contact: the contact type must be selected first, in the same way as creating a new node first involves choosing what content type will be added. * Defines the Contact Type configuration entity. This is very similar to the Contact entity we defined previously: most of the heavy lifting is done by the annotation comment, which defines some extra fields specific to config entities (config_prefix and config_export). Later, you should be able to see config entities stored in the config table, whose name and content satisfy those two annotations respectively. By inheriting from ConfigEntityBundleBase we also inherit all the relevant behaviours and interfaces from config entities; the only remaining method we define is isLocked(). This just prevents editing of the config entity (e.g. its ID) after it's been saved: this is referenced by contacts as their bundle identifier, so might otherwise lead to orphaned content. Once our ContactType exists, we must complete the connection between it and Contact. In the bundle's annotation comment, we already declared it was a bundle_of = "contact": however, we need to make this declaration bi-directional. Because baseFieldDefinitions() already calls its parent:: method, we don't need to do anything else for bundle-specific fields to be applied to a Contact entity. 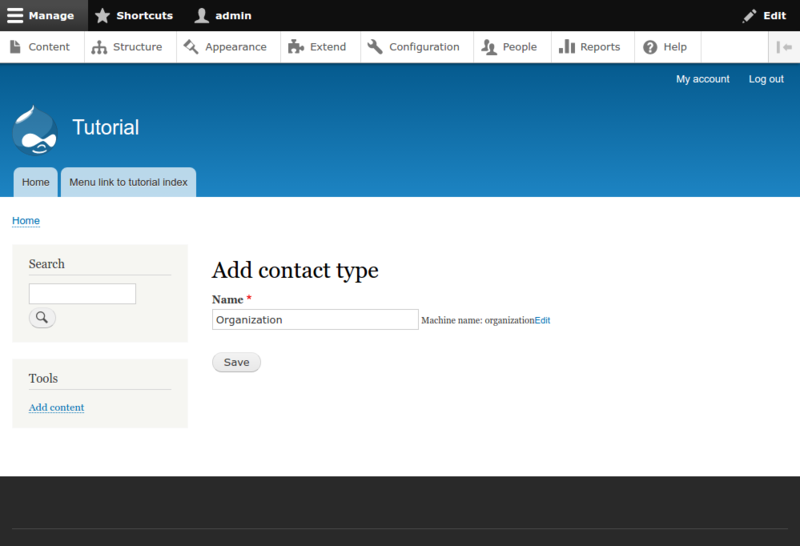 * Form controller: add/edit form for contact types. * Controller: list of contact type entity. Although this seems like a lot of extra code, it's very similar to the Contact controllers implemented previously (changing the behaviour of the submit form, and extending the columns used in the listing table, respectively), so we don't discuss it further here. These are almost a cut-and-paste of the routes we added for contacts previously, so we don't discuss them here. // Later, we can use theming to write this HTML properly. In this new method, we take advantage of the inherited dependency injection (DI) on ControllerBase to retrieve an entity manager service: we then ask this service for all the contact_type entities (referencing the ContactType's @ConfigEntityType(id) annotation property) and list them. Right now, we assemble the markup tag by tag: later we'll look at theming in Drupal, which provides better methods for doing this. # Entity bundle action links. This allows the action button to access the intermediate "pick a contact type" page, which is now a requirement for adding a new contact. We now have a UI for adding new bundles; but if you wanted to add some bundles and field configurations initially, the recommended method is to use configuration YAML files as below. However, you might sometimes want to manipulate fields programmatically, so further below is an example of how to manipulate field configuration associated with a bundle directly, using PHP. The person bundle, for person contacts. The field_jobtitle field configuration, and field storage configuration. 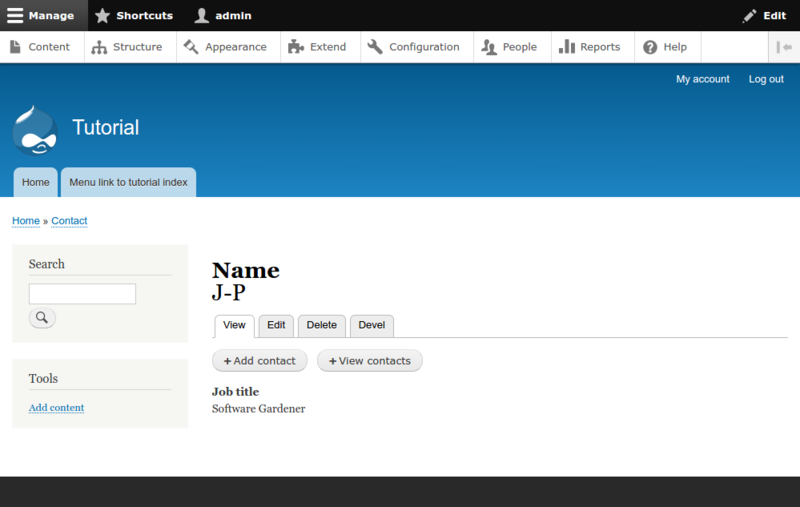 (Optional) two lots of display configuration for person fields, for both the editor's form and the site visitor's view. While the last item is technically optional, you should always provide display configuration for fields, as otherwise they might not be editable, or visible. For nodes and content types, Drupal's UI does that for you; building such a UI for contacts isn't really in scope here, though. Below are the five YAML files, each with a very brief discussion (we'll talk about configuration management and export files later.) You can put these YAML files in the config/install/ folder of the d8api module; but note that, to install the configuration, you'd need to disable and then re-enable the module: if so, delete all existing contact entities first. Remember that, if you want to use this service in a class, you should use DI, as discussed previously. As we're discussing configuration management later, we won't go into any further detail about this here. Between the configuration file name(-spacing), and the file itself, there's no need to state any further dependencies. The field configuration depends on both of our previous configuration YAML files: the person contact type, and the field storage; the file itself defines things like the label and default value for the field. Form and view both ideally need display configuration. These are long files, because they have small elements of configuration for each field (including both the person-specific field_jobtitle and the contact-wide name field. However, they should hopefully be self-explanatory. 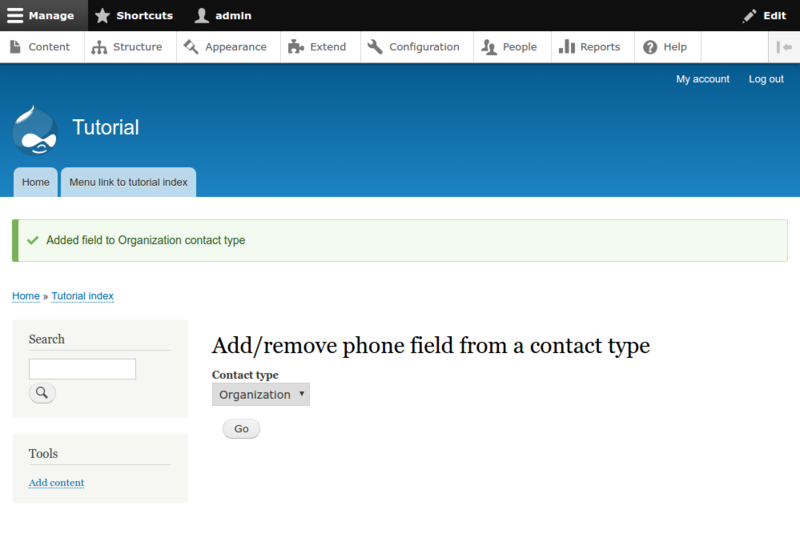 Let's create a new form controller, which will permit an administrator to select an existing contact type through Form API, and either add or remove a "phone" field from it. This isn't a replacement for the fully-featured UI that node content types usually have for adding and removing fields, but should hopefully demonstrate some of the important principles. 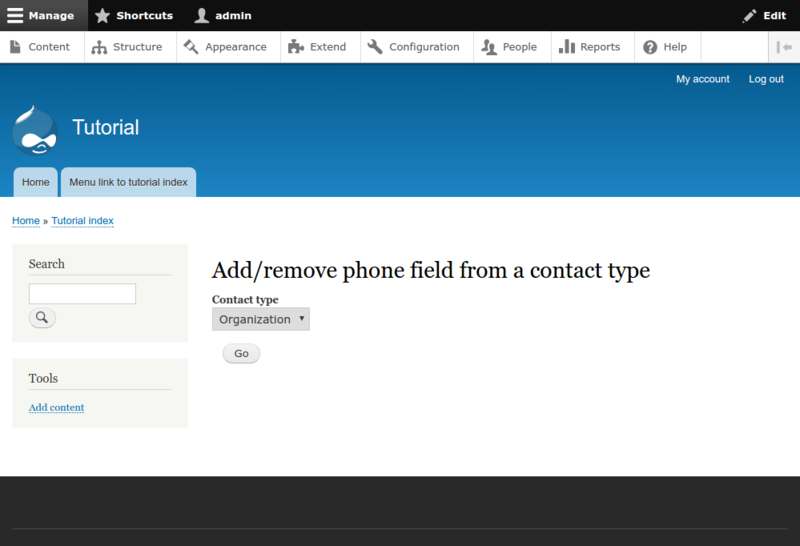 * Form: add/remove field on contact type bundle. 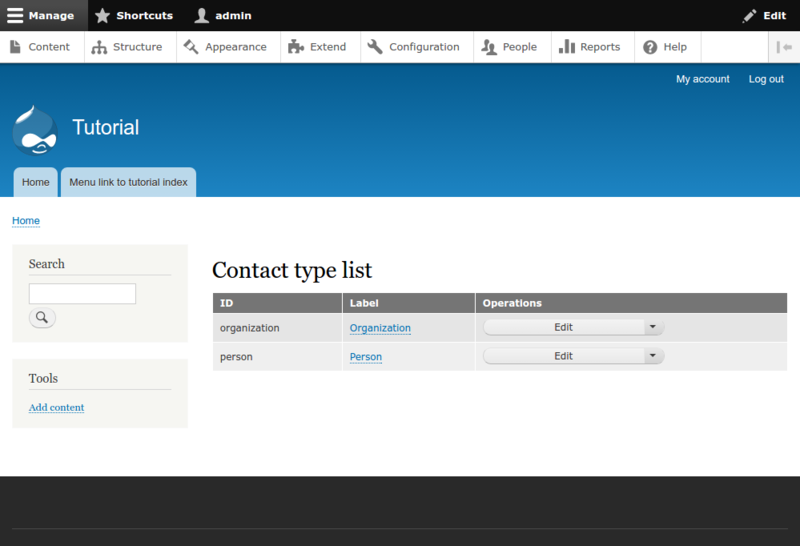 // Save contact types in form state for later. // Use them, right now, to populate the dropdown. // Retrieve bundle ID and related bundle. // If field already exists, delete it. // Add the field storage configuration, and field configuration. 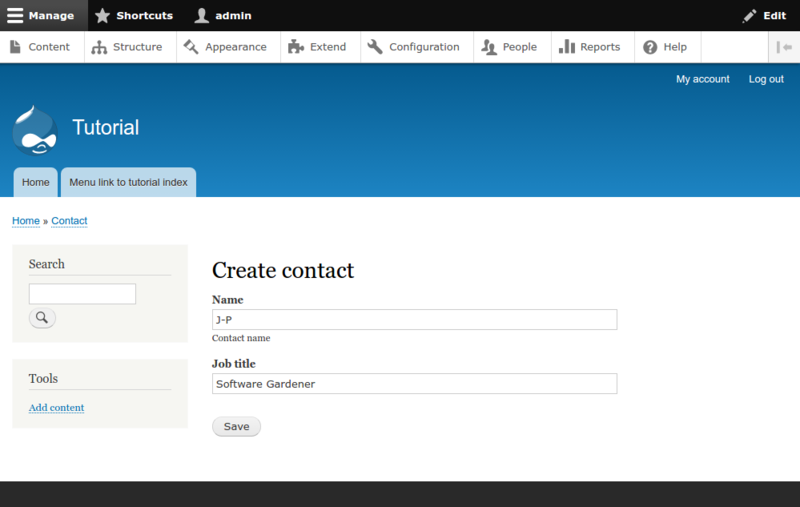 // Configure form and view displays to show the field. The two manager services are provided using DI, as discussed previously. Form state is used to both temporarily store the contact types (to avoid having to look them up more than once) and also to store the values submitted via the user. Non-object methods like entity_get_display() and drupal_set_message() have crept in, for simplicity. These are well-tested methods and so are less of a problem than they might otherwise be, but you should consider factoring them out later. Field storage type and display formatter types ("string", "text_textfield" and "string" respectively) need to match field storage and formatter plugins (we've discussed the plugin architecture previously. If in doubt, you can use the Plugin module, or examine the dropdowns in the content types/add field UI and use the values for the options there. Field configuration, and field storage configuration, persists through a two-step process of first creating, then saving: we've seen this before for nodes, and it's the case for other entities. In the display configuration, while we do set a single component, the save() method is acting on the entire configuration. You should be aware of this, because this step might fail with no clear reason, because of a mistaken display formatter type in e.g. the Contact#baseFieldDefinitions() method. This permits a route to our new form controller, as discussed previously. To get Drupal to recognize the ContactType class and other changes, you would usually clear caches. However, because we've made substantial changes elsewhere, you should disable and reinstall the d8api module completely. Note that you might need to delete all existing contacts to do this. If you see all this then congratulations! 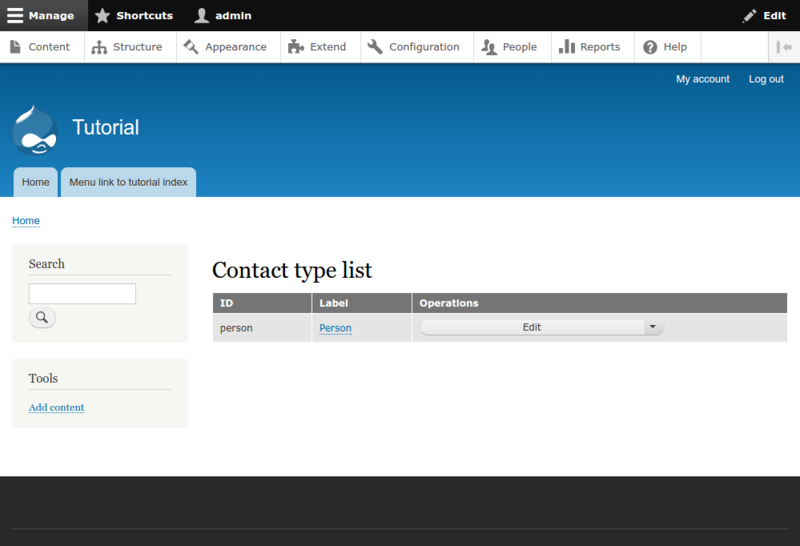 you have added, configured and otherwise manipulated Drupal fields through both the fields API and through YAML files.